Medieval annular brooch of pewter or lead-tin alloy and of 13th or 14th century date The brooch is near-complete, missing the lower part of the pin but is heavily-corroded (with a weight of 3.4g). The annular frame is sub-circular (with an external diameter of 24.8mm - 25.9mm, an internal diameter of 18.5 - 19.0mmmm) and is circular sectioned 2.4mm diameter). The encrusted corrosion has masked much of the decoration but a cast twisted, 'cable' motif is evident over one half of the frame and probably only on one face. No decoration is evident on the other face. There is a constriction for the pin on the frame (3mm wide). The pin (with a surviving length of 18.1mm) remains in place and the corroded loop (with a depth of 5.7mm) no longer moves. The pin has a bevelled collar moulding at the top of the pin shaft. The shaft appears to have been sub-circular sectioned and with a consistent width to the break. The surface is encrusted with a mid to dark-grey corrosion. 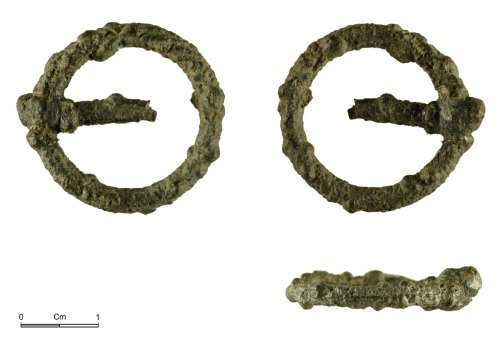 A copper alloy brooch with a circular-sectioned frame and twisted cable decoration over half the frame was excavated in London (Egan & Pritchard 1991, no. 1310, p 249) from a mid-13th century context.